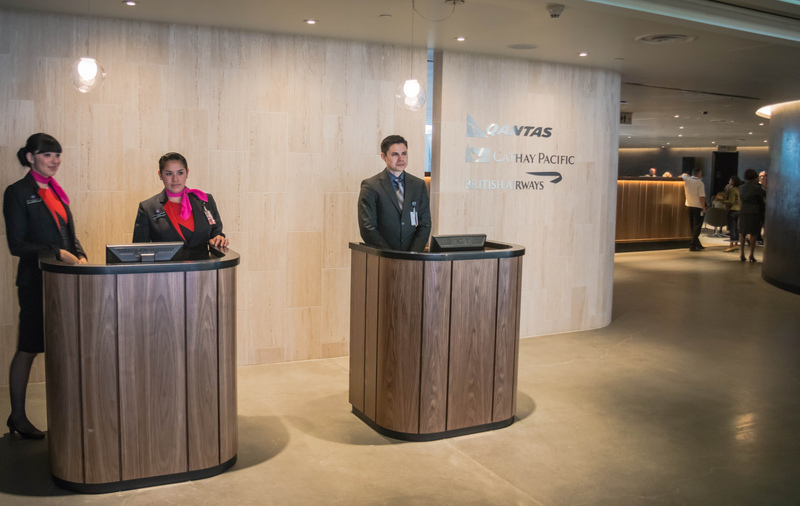 Overview: Oneworld alliance partners Qantas, British Airways and Cathay Pacific debuted a new luxury lounge on June 17 for first- and business-class passengers flying out of the Tom Bradley International Terminal at LAX. And although the lounge is branded specifically for these three airlines, who footed the bill for this project, the club is actually open to all Oneworld partners. Qantas is the lead player and the one responsible for bringing in the outside management firms that oversee foodservice and overall operations. 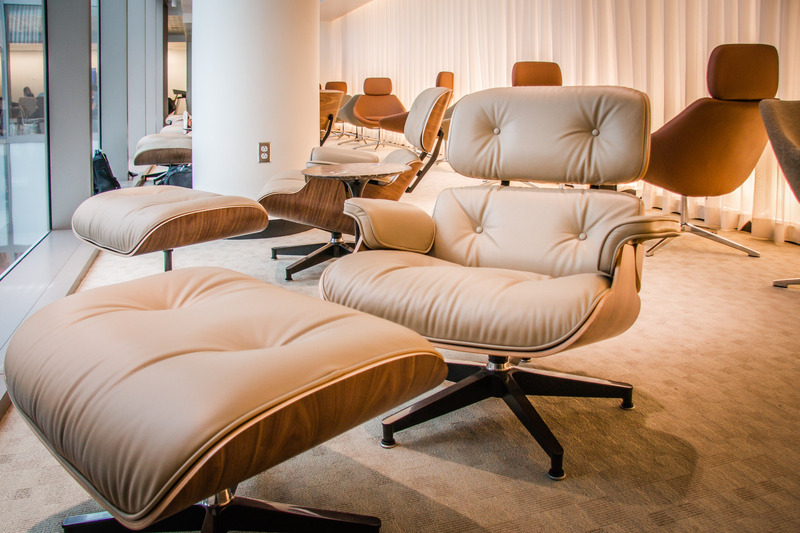 The look and feel of the lounge pays tribute to L.A.’s midcentury legacy: including an entire wing lined with Eames lounge chairs and ottomans. A communal circular fireplace provides a great place for socializing. Natural light pours into the lounge from floor-to-ceiling windows of a central atrium. The lounge currently accommodates up to 400 customers. 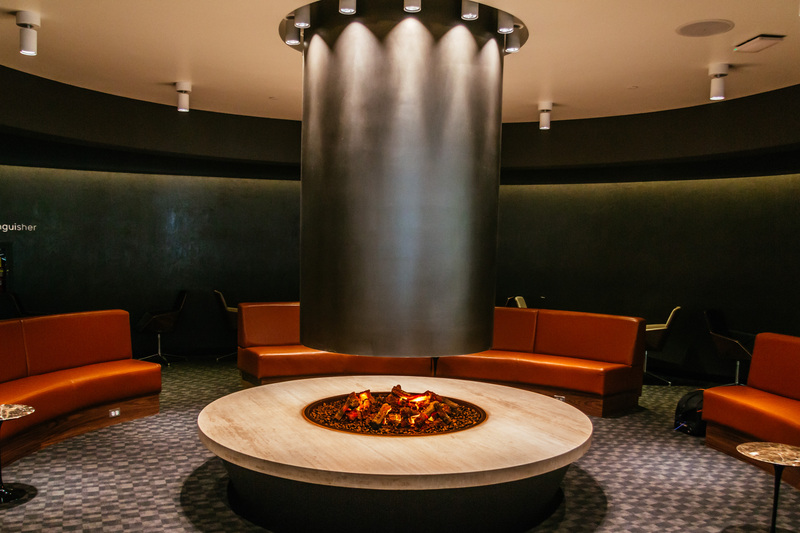 Location: The new lounge is located on the upper deck (Level 5) of the newly revamped Tom Bradley International Terminal, adjacent to a new food court and a full-service steakhouse. Access: Business-class and first-class passengers on Oneworld affiliated flights departing from Tom Bradley currently have access to the lounge with a valid boarding pass and invitation from their airline. 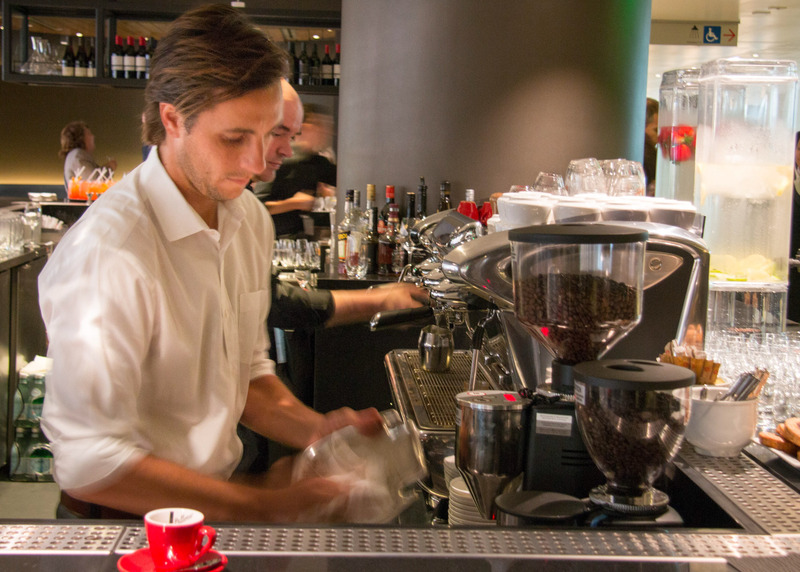 Service: Qantas hired Sofitel to manage the lounge. This is the first time a luxury hotel brand has assumed the management of an airline lounge in Los Angeles. 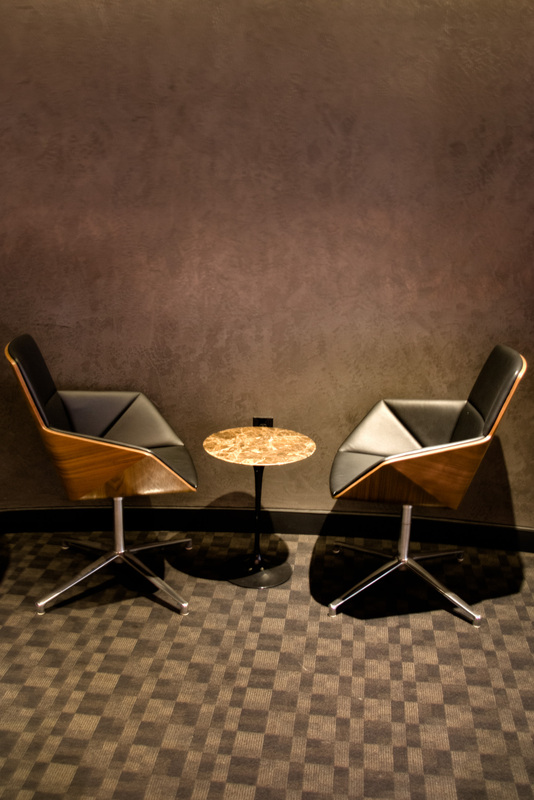 Sofitel operates Qantas lounges in Sydney, Melbourne and Singapore, for example, while Peninsula Hotels manages Cathay Pacific’s swanky clubhouses in Hong Kong. As such, service throughout the lounge feels more like what you would encounter in the lobby lounge of luxury hotel rather than at a typical self-serve airport club like the Oneworld facility this one replaces. Cocktail waitresses roam the club making sure everyone has a drink. Savvy mixologists prepare a full roster of artisanal cocktails. And the baristas turn every cappuccino into a work of art. Food/drink: Sydney-based celebrity chef Neil Perry oversees the foodservice for the lounge, which right now includes a lavish buffet of hot and cold salads and full-sized entrees made from scratch, not merely little snacks. Two mobile carts also serve made-to-order tacos and hot dogs. Perry offers two types of tacos, one filled with fried fish and another made with spicy pulled pork. The pork is outstanding. Perry hasn’t yet grasped the local technique for cooking tortillas, and his fish doesn’t have the right kind of batter to be called authentic California- or Baja-style, but there’s no denying the quality of ingredients or made-from-scratch efforts. And everything is free, so it’s hard to quibble about things like that. Amenities: The lounge is very laptop friendly and features electrical outlets at most seats. For customers who wish to freshen up before their flight, the club currently offers nine shower suites with body products from Australia-based Aurora Spa. And customers traveling in first class — as well as Qantas platinum flyers and oneworld emerald members — gain access to exclusive services like complimentary shirt pressing and shoe shining. Still to come: Early next year a separate first-class lounge for up to 200 passengers will open adjacent to this one. The existing space will then transition to business-class only, with the addition of seven more shower suites and a separate family zone. The upcoming first-class lounge will also feature a full-service Neil Perry diner, the chef’s first full-service restaurant in America. Bottom line: This a huge improvement from the former Oneworld product at Tom Bradley. Frankly, it’s not as visually spectacular as the competing Star Alliance lounge that opened in this terminal in September, what with it’s outdoor terrace and views of the runway, but the Sofitel service at Oneworld is a definite triumph over Star Alliance. Neil Perry also sets a new standard for food and beverage in an airport club at LAX. This article originally appeared in the Orange County Register, the Los Angeles Register and the Riverside Press Enterprise. To view more of my work for the Register, check out the archives. For more dining and travel inspiration, I invite you to follow me and join the conversation on Facebook, Instagram and Twitter.